"Remember that you are dust, and to dust you will return." "Turn away from sin and believe the Good News." On Ash Wednesday, the first day of Lent, we receive ashes on our foreheads, with one of these formulas. These ashes are from burned palm branches, from last year's Passion (Palm) Sunday celebration. As ashes, they remind us of our own death, as they introduce us to a season in which we will celebrate the gift of eternal life we receive through the death and resurrection of Jesus. And, they serve as a powerful, counter-cultural sign, as we walk out into the world with crosses on our foreheads - signs of our faith. These ashes also serve as a sign for us interiorly, that we understand who we are - creatures who will die - and creatures who need to turn away from sin and accept the Good News of God's mercy and the promise of life everlasting. The challenge is that the ashes wipe off very easily and we forget they were there and what they mean. This reflection is about imagining our remembering those ashes throughout Lent, and what that could look like for us. The beauty of symbols is that they can carry many levels of meaning. Ashes are a great example. For most of us, the ashes drawn on our forehead, whether it is a nice looking cross or a bit of a broad smudge, are uncomfortable. We are not used to wearing signs quite like this. Some people will immediately know that we are Catholics and we've been at Mass. Children especially become fascinated to see parents, teachers or other adults wearing ashes. They will often ask what they mean. Some people we encounter at work, at the store, at a social event will look at us strangely and wonder at, if not be inspired by, this sign of faith on our foreheads. Part of the ability to remember the ashes throughout Lent is to let the symbol have meaning for me on Ash Wednesday and to reflect on that meaning, with the intention of remembering. 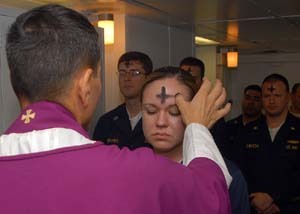 Then, it can be possible to "wear" the ashes interiorly for the rest of Lent. If I can accept the reality of "remembering" that I am dust, on Ash Wednesday, I can remember it after the ashes are gone. We can be tempted in our world today to live in denial about death. At one level, we may know we are mortal, and yet we too often live as though death is very far away. It is easy to deny the reality of death. We have so many ways to "put death off," so many ways to keep "looking young." In our independence, we can try so hard not to be vulnerable or weak at all. We praise strength and toughness. The reality of being mortal is not to surrender hope or vitality. Quite the opposite. To realize that we are limited and fragile, can lead to a humility that opens our hearts to being truly dependent on God, and more profoundly open to the reality of our redemption. Through the death and resurrection of Jesus, we have been saved from the power of sin and the power of death. It opens us to a new hope and deep vitality. That's why it is so important to remember the Ashes all throught Lent. It is remembering the humility of that first day. It is remembering a continuing openness to placing my life in God's hands. This remembering opens us to the graces of Lent for us. I am a creature in need of God for life itself - the gift that gave me life, the gift that sustains me each day, and the gift of eternal life. The worst than can happen to me is that I will fall into the hands of a loving God. The result of this humility-leading-to-deep-confidence-and-trust is that we can live our lives with greater freedom and courage, even boldness. People who humbly live with ashes on their foreheads, and in their hearts, can walk with confidence in God's merciful and redeeming love. People who know where they've come from and where they are going can live and love boldly. Ashes on Ash Wednesday - and a spirit of the ashes all during Lent - can prepare the way for great graces as we ask our Lord to free us and make us kinder and more compassionate with others. Whenever I'm struggling with what I'm "doing" during Lent, I can refresh my memory of the ashes with which I began this journey. It can be a "reset" for helping me return to being a humble creature, beloved by God, and eager to believe the Good News.